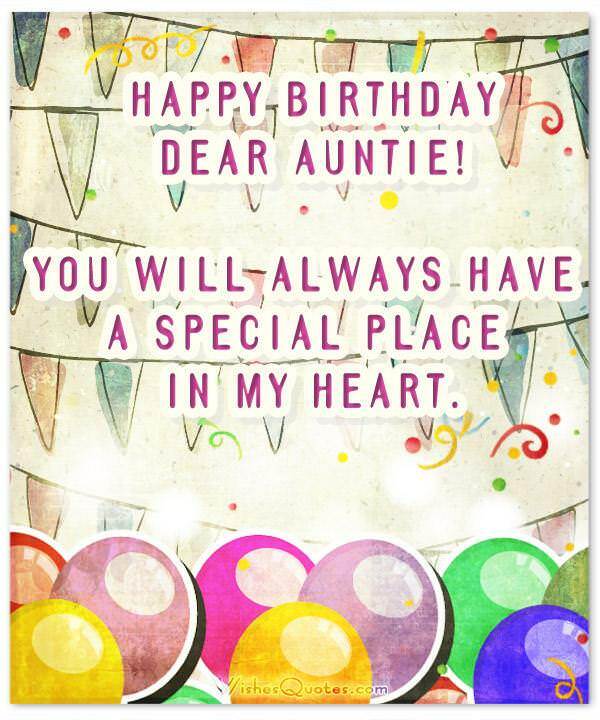 Check out our wonderful collection of heartfelt messages for your aunt’s birthday. If you have an extraordinary aunt, then you know what a blessing having an aunt can be. Sometimes a special aunt can feel like a second mother and a dear friend. If you have one that’s special to you in some way, make her birthday a time for giving thanks for all she does for you. Give her a gift and a card with sweet words written inside of it. Let your emotions be conveyed. Also, post your birthday message on a social media site. Let your aunt feel as special as she makes you feel. Make her feel appreciated by taking the time to say what’s in your heart. Write down keywords like awesome, best, and super if you know how you feel, but don’t know how to put these words into sentences. Read the following birthday wishes for ideas. Aunts are special. You’re the best. Thanks for being a second mother to me. I send you love and birthday wishes on this important day. When I think of you, I think “awesome”. 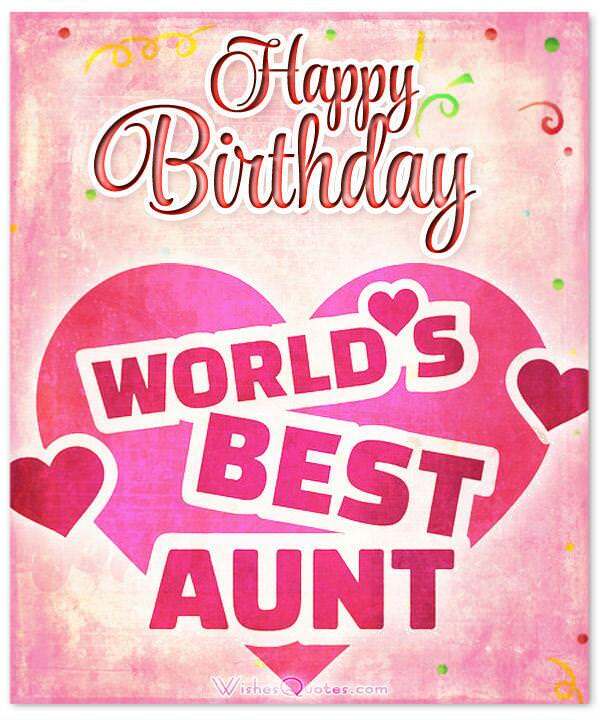 You are the best aunt ever, and your birthday is the perfect time to tell you so. You’re a super aunt. It’s a super day. And I’m as happy as can be because today is your birthday. Wishing you oodles of happiness. My dear aunt, you deserve nothing but the best of everything on your birthday because you are everything to me. Hope your day is wonderful. Like a mother, you guided me through life and gave me good advice. I thank God for a great aunt like you. Blessed birthday wishes! When God made angels, one of them was you. May your birthday be as heavenly as you are. Best of luck today and every day. You’re in my heart, and every day I think about how lucky I am to have an aunt like you. Thank you for everything. Happy Birthday! You are no ordinary person. You are a magnificent aunt who has done a lot for me. Happy birthday with love and much sincere gratitude. I never told you how wonderful you are, dear aunt. You’re someone I’m happy to have in the family. Wishing you love and birthday wishes. I’m always thrilled to celebrate your birthday because aunts like you are few, and to have one like you in the family is a blessing. I remember how you took care of me when Mother wasn’t around. You have a heart of gold, so on your birthday I wish you the best. On your birthday, may the joy you experience be as intense as the joy I get from having a wonderful aunt like you. Wishing you many blessings! I wish you rainbow skies because you’re an awesome aunt who has colored my world beautiful. Birthday wishes to the best aunt in the world. A is for awesome, U is for unique, N is for neat, and T is for true. That’s you my cherished aunt. Happy birthday wishes! Happy Birthday, auntie. You’re wonderful beyond words, and I’m so happy to have you in my life. May all of your fondest wishes come true. Make a wish, and I’ll wish it so. Because it’s your birthday, you should know, your thoughtfulness is appreciated. Best wishes on your special day. I celebrate your birthday, and because I have such a wonderful aunt like you, I have even more to celebrate. Happy birthday wishes to you. Happy birthday to my loving aunt. I have so much to be grateful for because of you. Thanks for all you’ve done for me. Many blessings. I take this special day of your birth to say “I Love You”. 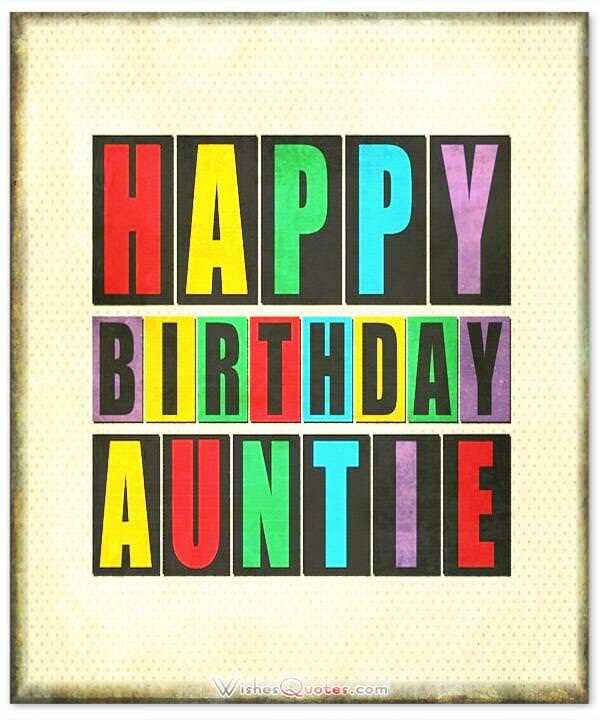 You are a loving aunt, and I wish you a happy birthday. You’re my aunt. You’re like a mother. I’m so happy that you are. I wish you much luck on your birthday and for the future. Everyone should have an aunt like you. You’re a kind and compassionate soul that really understands me. Sincere birthday wishes for everything your heart desires. If someone asked me who my favorite aunt was, I would say it’s you. You’re super cool. Have the kind of birthday you’ve always dreamed of. Happy birthday to an aunt I love for so many reasons. May good luck brighten all your days and fill your heart with joy forever. I’ll bet nobody has an aunt as wonderful as you. I feel so lucky, my birthday wishes to you are more than I can list. Happy birthday to an aunt who makes me laugh when I feel like crying. Hope all the sunshine you bring me comes back to you.